Recently, I realized that Genevieve really liked to help wash dishes (it keeps her busy while I wash most of the dishes). I put her up to the table with a dishcloth and she could wipe! I just had to move her from chair to chair. Time for my kids to have kitchen jobs!! I did make them a chart because I don’t think they could keep track on their own just yet. I had all of the stuff (scrapbook paper, brad, stickers, silhouette art) on hand already so it was really quick. We have been using the Kitchen Job Wheel for a few weeks now. I help them with the jobs (especially Genevieve), but it really makes cleaning the kitchen easier! What is really funny is that they have their favorite jobs (just like when I was growing up!). 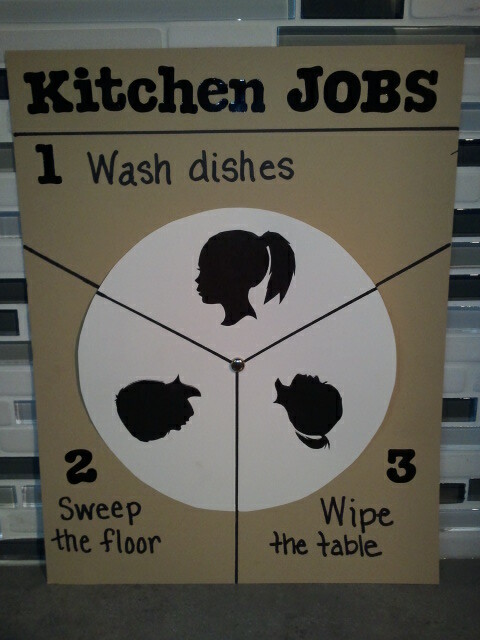 Ginger likes wipe the table, Liam likes sweep the floor, and Genevieve LOVES to wash the dishes. Genevieve gets upset sometimes when it is not her turn for dishes. They still need lots of practice so I am planning for them to get points for doing their kitchen jobs during Super Summer Challenge to get them in a habit. Anyone else have good memories to share of doing jobs/chores as a kid? I am married to my college sweetheart and have three beautiful children. Things that interest me include: kids, healthy foods, coupons and great shopping deals. I am getting used to life with three little ones and my goals are getting my home organized, getting back into shape, and most of all loving my family & friends well each day! This entry was posted in Crafty, Genevieve, Ginger, Liam and tagged Chores for a young child, Silhouette Art. Bookmark the permalink. Thank you, Dad! I love you! Love the creative way to make chores fun! Thanks for the inspiration. Thanks, Amy 🙂 I was so excited tonight when I told them to clear their plates while I was talking to Travis in the other room. When I walked back into the kitchen, they (Ginger and Liam) were already working on their jobs!! While contemplating if I would like to start a blog, I asked Bill what I should name it. I think he was getting ready for work and replied, "I don't have time for this." Needless to say, I asked him to clarify that comment and he really did mean for that to be the title of the blog. I can say "I don't have time for" a lot of things in life, and blogging could be one of them. However, my desire to share updates about the kids with family and friends, take the pictures off the camera more often, maybe share a random CVS deal, and to take the time to write about these precious days when my kids are so little, won out. I even found that I could use my phone to email a post, so I can blog and use my elliptical at the same time (see that is how I am finding the time). I hope you enjoy my new "journal" of what goes on around here.